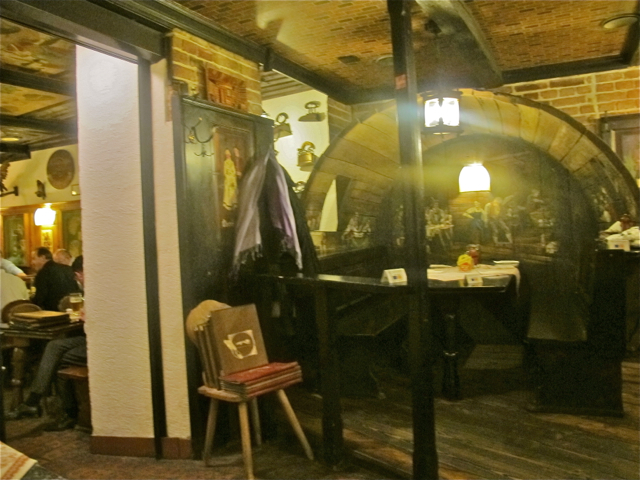 Where: Gaststrube Pürstner, Vienna; operated by the Purstner family for three generations. 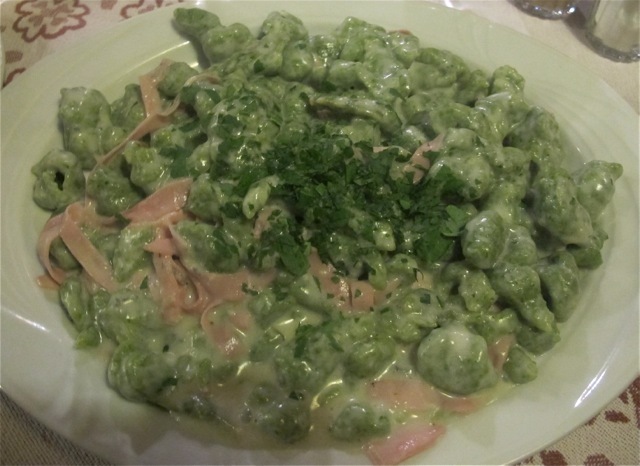 Dish: Spinatnockerl (Spinach spätzle with ham and blue cheese), came with a side salad for 7.80 Euros. Portion was huge. Why: I asked the concierge at the Palais Hansen Kempinski for a recommendation for a low-key, traditional, comfort-food experience with reasonable prices. Setting: A warren of intimate rooms, each with a different character. I dined in the Cask Room, accented by tables set in in wine casts along with traditional artwork, including hand-painted murals. Other rooms featured ceiling paintings, wood carvings, and other folk art. Waiters in lederhosen, of course. Bottom line: Perfect! I’m still thinking fondly of this dish and trying to replicate it at home. Service was punctual–not warm and fuzzy, but efficient and friendly. I’d return again, and I’d order this again (although there were plenty of other enticing options on the menu). Tags: food, Vienna. Bookmark the permalink.